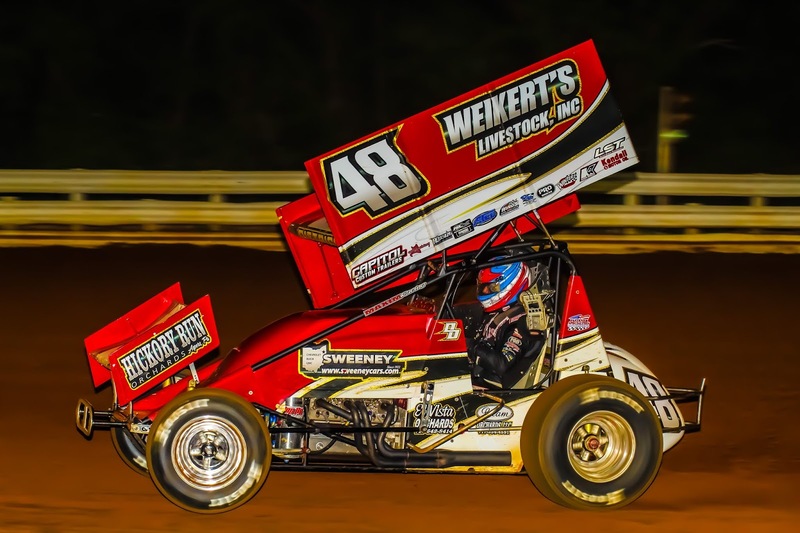 Mechanicsburg – Danny Dietrich of Gettysburg scored his first Williams Grove Speedway sprint car win of the season on Friday night, taking home $4,100 for the victory that included a $500 bonus for winning from the fourth row. Veteran Rich Eichelberger took the win in the make-up 358 sprint main, held over to be completed after rains hit with four laps completed on May 11. The regularly slated 358 sprint main was taken by Doug Hammaker. The 25-lap 410 sprint main was marred by a pair of red flags before the first lap could even be completed. The first red flag came out when Adrian Shaffer slammed the inside frontstretch row and flipped over while Tyler Ross also flipped coming out of turn four. The ensuing restart saw a five-car melee ensue on the frontstretch that involved TJ Stutts, Kody Lehman, Nicole Bower, Dwight Leppo and Jim Shuster. On each attempted start including the one that saw the first lap able to be completed, Dover’s Landon Myers took the lead over Eric Tomecek. Tomecek was soon overtaken by fourth starter Lucas Wolfe however although Wolfe was unable to close in on Myers for the lead. Instead, he eventually had to contend with Danny Dietrich, who moved into third with six laps completed. Dietrich chased down Wolfe and snared the spot narrowly on the ninth tour. And by that time, Myers was far enough in front to lead another four laps before Dietrich could catch him. His first attempt at taking the lead saw Myers fight back around the outside of the first and second turns to reclaim the spot but seconds later as the pair raced into the third turn, Dietrich shot low and came up with the lead before running away from the field to the finish. Wolfe relegated Myers to third with three laps to go before Freddie Rahmer backed him up to fourth at the finish. Cory Haas rode home fifth. Sixth through 10th went to Greg Hodnett, Steve Buckwalter, Rodney Westhafer, Anthony Macri and Mallie Shuster. Heats went to Myers and Adrian Shaffer. The victory was the 19th of Dietrich’s careeer at Williams Grove. Doug Hammaker would end up leading all 20 laps of the regulary-slated 358 sprint main. Brie Hershey raced a challenging second for the first three laps before Chase Dietz overtook her for the spot. Dietz was riding Hammaker’s fuel cell, appearing ready to make a move for control when the red flag appeared with six laps to go when point leader Kevin Nouse flipped outside the first corner in wild fashion. On the restart, Hammaker looked stronger and pulled away to the win, his first of the season at the track and sixth of his overall Williams Grove career. Dietz settled for second followed by Troy Wagaman Jr., Hershey and Matt Findlay. Sixth through 10th went to Todd Rittenhouse Jr., Jeff Halligan, Scott Fisher, Scott Arnold and Brent Shearer. Heats went to Fisher, Hammaker and Hershey. Rich Eichelberger of Dillsburg restarted second behind Todd Rittenhouse Jr. with four laps completed in the make-up 358 sprint main only after the slated leader took himself out during warm ups. Cody Keller was leading the race on May 11 when the rains hit and was slated to restart with the lead only to flip in practice laps and sideline himself for the night. Rittenhouse led until lap 14 when Eichelberger drove to his outside coming out of turn two to take command and the victory. It was the third win of Eichelberger’s career at the track. Troy Wagaman Jr. got by Rittenhouse for second with Dwight Leppo finishing fourth and Brie Hershey riding home fifth. Sixth through 10th went to Chase Dietz, Glenndon Forsythe, Brent Shearer, Kevin Nouse and Chris Frank.